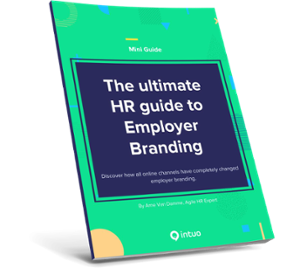 No need to write a long introduction since this Mini Guide boils down to two things: examples and tips on how to build a strong employer brand. Nothing more, nothing less. There is also a proven direct link between employee satisfaction and customer satisfaction. And, organisations with a strong employer brand have less turnover. The framework we propose is one of its kind and explains why and how you should strategically develop your employer branding before you go over to the actual application and possible hiring of an employee. Employer branding and marketing are strongly related. In the same way that marketing tries to attract and engage customers, employer branding tries to attract and engage (potential) employees.The framework, a derivation from marketing, consists of 4 aspects you need to invest time and money in: Attention, Data, Time, Application. Don’t try to sell your applications straight away. Take intermediate steps and create awareness first. Your chances of acquiring top talent will then increase significantly. Want to know more on this topic? Download the Mini Guide!